Recent months have brought more disastrous wildfires, more senseless mass shootings, and other tragedies of violence and stress to our communities and the world. With frightening current events filling the constant news loops and real-time images on social media, many families–adults and children alike–are understandably experiencing increased feelings of helplessness, stress, and overwhelm. In these difficult times, even when not directly impacted by a tragedy, children are at risk of increased levels of anxiety that can affect their behavior and overall sense of well-being. Some amount of anxiety is natural for all of us in the wake of a tragedy; however, when children and teens view the world as a scary place, they live in a state of heightened anxiety that can cause observable behaviors that parents and teachers may notice. Exposure to frightening or unsettling events can trigger kids’ anxieties about their own safety, or fears about the safety of their caregivers. For example, a younger child may experience an increase in anxiety around separations and might resist going to school and cry, cling, or become upset when required to separate. Children and teens experiencing excessive anxiety and stress may experience internal symptoms that are not readily apparent to others, such as pervasive feelings of worry, nervousness, or a sense of being on-edge. These feelings can result in irritability, difficulty concentrating, withdrawal, or acting- out behaviors. Some children and teens may have difficulty sleeping, or struggle with negative, worrisome thoughts that they are unable to shake. Excessive anxiety triggered by sirens, news reports, or a related stressor can trigger “fight or flight” reactions, the body’s normal response to danger, which can cause stomach butterflies or a racing heart. It is natural for children and teens to have worries related to frightening events. When hearing about fires, shootings, acts of terrorism, and displaced communities, “what if” worries and feelings of uncertainty for their own safety may be activated. For example, they may wonder, imagine, or talk about what they would do in a similar situations, or how they might help or get help. Younger children may act out imaginary emergency and rescue scenarios in their play. Children depend on their parents, teachers, and other trusted adults for their safety and a sense of security and connection. This includes looking to the adults around them for information and cues about what to think and how to respond. 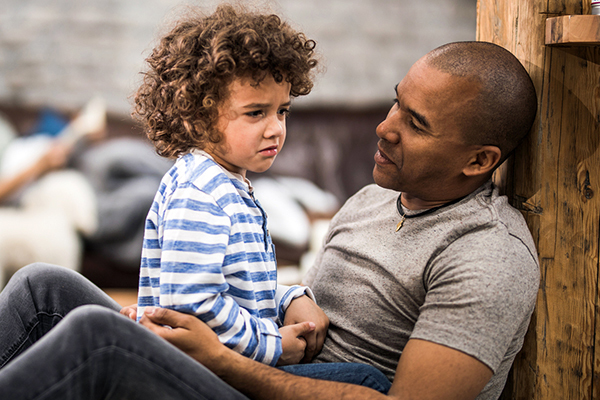 When the adults in their lives are very anxious, worried, or apprehensive about safety concerns, children often take on and internalize this heightened anxiety. Talk with your child in a calm manner. Encourage them to ask questions and share their feelings. It can help them to hear that their worries are understandable. At the same time, model and communicate calm, rational thinking and problem-solving to address the “what ifs” your child may be worried about. This will help you to better understand what they have heard, what questions they may have, and what may be the exact cause of their worries and fears. Understanding a child’s particular worries is a step toward helping them work through their fears and difficult feelings. It’s important to know what’s going on, but avoid exposure to graphic images or news footage that may increase anxiety or overwhelm. Choose what information to share and explain it in a way that is age-appropriate for your child. Simple healthy habits like eating nutritious foods, taking walks together, and consistent bedtimes can provide a sense of predictability and comfort. Take breaks and relax together, focusing on positive activities. Increased connection can ease anxious feelings when kids are scared. Sharing news of positive events from the day, and practicing expressions of gratitude, can help foster positive emotions and offset anxiety. Chronic excessive anxiety can interfere with a child/teen’s functioning, health, and well-being. If you have concerns, please reach out to Parents Place. Our specialists provide coaching, consultations, and clinicians who work with children and families, in times of stress and anxiety, and otherwise. Seeking other resources for connecting as a family? Attend a workshop, schedule a parent education meeting, or schedule an assessment with one of the Child and Adolescent Specialists at Parents Place. Karen DeVaney, Psy.D., provides psychotherapy, consultation, and assessment in her work serving children, adolescents, families, and adults of all ages and stages of life. She has specialized training in child assessment/psychological testing and applies strengths-based approaches in her work. Karen earned her doctorate in clinical psychology from the Wright Institute in Berkeley, where she also serves as adjunct faculty to provide collaborative supervision for advanced doctoral students.